When Joss Whedon stepped in to direct the reshoots on the Justice League movie, the production hit upon a surprisingly difficult issue: Henry Cavill, who plays Superman, had grown a big mustache for a role in Mission: Impossible—Fallout. Paramount refused to let him shave it for Justice League, in what was called a “ridiculously petty” move by a visual effects artist, forcing Warner Bros. to digitally erase it. The end result looked pretty awful, but Cavill at least had some fun with all of the drama his facial hair had caused. 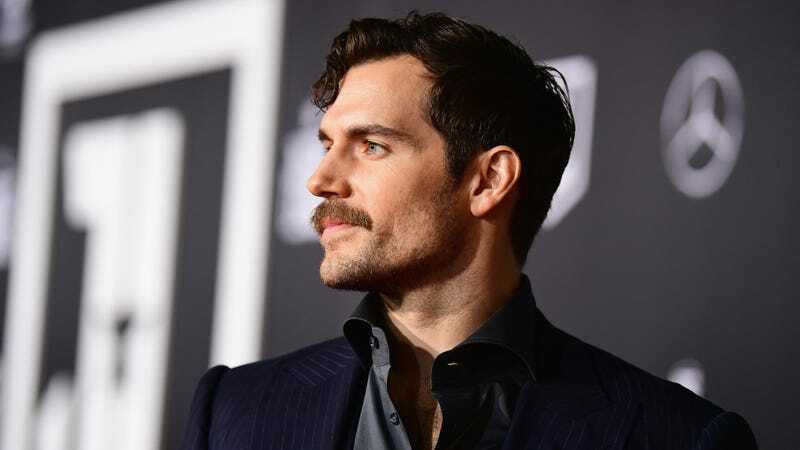 Recently, Cavill opened up to Empire about the mustache, which he once teased was actually a terrifying “beast” that would destroy the world if given the chance, saying that he “certainly wasn’t expecting all the events to unfold” the way they did when he agreed to grow the ‘stache for Mission: Impossible. That being said, there’s apparently some reason why a fake mustache “would not have been a possibility,” but he won’t say more until Mission: Impossible actually comes out. It’s unclear if the movie just required the honesty of a real mustache or if there’s some plot reason for why it absolutely could not have been fake, but maybe there’s a scene in Fallout where Cavill’s character dramatically reveals that his mustache isn’t real and they didn’t want to spoil that twist by having him wear an actual fake mustache. That all seems more confusing than it really needs to be, so it’ll be nice when we can forget about all of this after Mission: Impossible—Fallout comes out in July.